The average variation in these reproductions is not much above a sixteenth of a tone (12c). 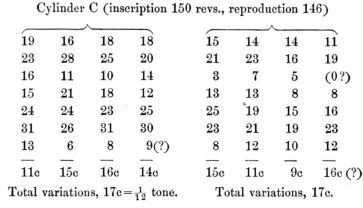 This is only about half the amount of variation to which I judged (by ear) a reproduction at 158 revolutions of Cylinder A (taken at about 140 revolutions) to be subject, in studying this cylinder at the beginning of the experiments. On Cylinder D I inscribed the harmonium c' at a very high rate, 218 revolu�tions. This proved an unmanageable speed, owing doubtless to mechanical conditions connected with the action of the screw regulating the supply of electricity. I found it impossible to tune the phonograph note to the Ut3 fork in such a way as to give beats easy to count, a very small movement of the screw producing a comparatively large change in the pitch of the phonograph note.